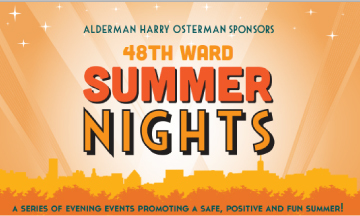 48th Ward Summer Nights is a series of events throughout Edgewater, Andersonville and Uptown promoting a safe, positive and fun summer. All of the events are free and open to the public. Our goals are to build community, connect neighbors and improve safety. Last year, with the help of many community partners, we hosted almost 100 events. This year’s calendar is equally full and includes many new and exciting programs. Please join us! Click here for the list of movies the 48th Ward will be playing around the community. Want to volunteer for any of our summer night events? Click Here.